The Harrier SUV is right now the most awaited upcoming Tata car in India. Pratap Bose, Head of Design, Tata Motors, has already confirmed that 85% of the Harrier’s SUV will stay true to the H5X concept. And now, here are our exclusive images of the new model’s interior. These Tata Harrier interior images show us many new details of the flagship SUV’s dashboard and other parts of the cabin. As you can see in the above image, the Harrier gets a dual-tone grey-brown interior colour theme. In the above image, you can clearly see that the interior of the Harrier won’t have the button-less design that was seen in the H5X. The small diameter steering looks similar to the one on other modern Tata products but has a new design for the centre-pad. The instrument panel gets conventional dials with a monotone back-lighting. However, there are two semi-circular digital displays for the fuel gauge and the distance-to-empty meter. The centre console gets a floating-type touchscreen infotainment unit. It looks a tad bigger in size than the one on the Nexon. The text mule sports a six-speed manual transmission. Sitting right in front of the transmission is a rotary selector for the drive modes. The design of the side air vents looks similar in shape to the ones on the Nexon. 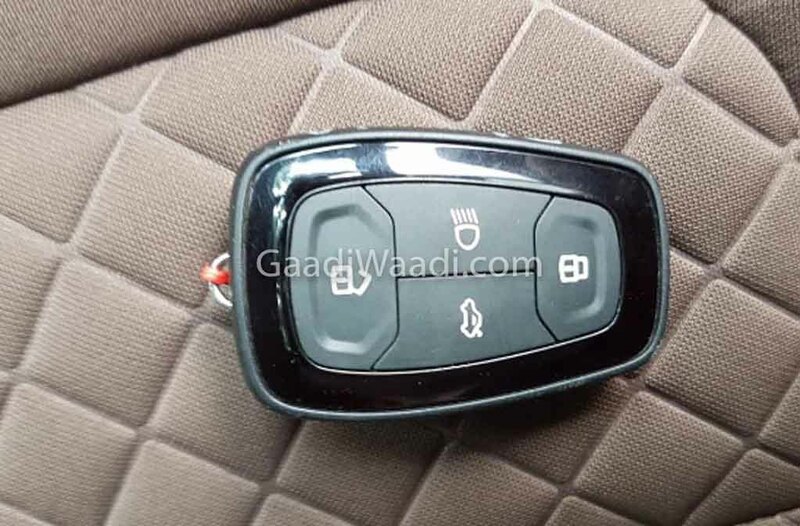 In the second Tata Harrier interior image, you can see the Harrier’s remote key. its design is exactly like that of the Nexon. It gets door lock/unlock, trunk unlock, and headlight on buttons. These are exactly the same features that you find on the Nexon’s remote key. 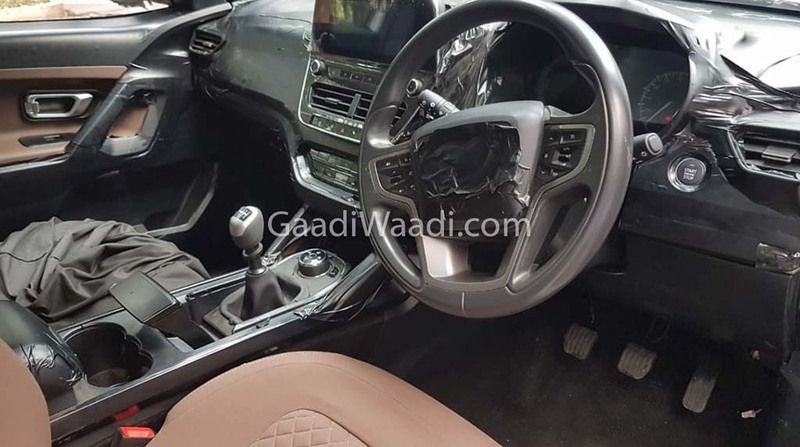 The first Tata Harrier interior image also reveals that the light controls are placed in the indicator stalk. It may be noted that the Hexa gets a separate rotary control on the dashboard for the light controls. In the third Tata Herrier interior image, you can have a good look at the premium upholstery that the upcoming flagship will come with. 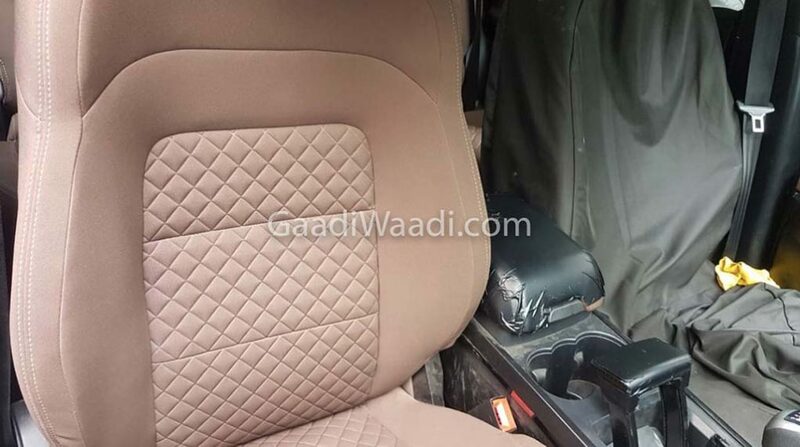 The seat upholstery is somewhat similar to the one on the recently updated Mahindra XUV500. Tata Motors has already confirmed that the launch of the Harrier will take place by the end of the current fiscal. The new SUV will be manufactured at the company’s Pimpri-Chinchawad facility off Pune, Maharashtra.